Childrens Cannibal Kids watch in bright blue with a plastic case and bright blue dial. This timepiece is set around a high-visibility dial with large white combination numeral and baton hour markers. The watch fastens with a blue rubber strap and is powered by a quality quartz movement. Great kids watch very smart and good value for money. I bought this watch for my son for Christmas, its perfect he loves it n its waterproof which he loves. bought this as a Christmas present for a seven year old grandson, so no feedback from recipient yet. The watch was perfect birthday gift for our grandson. He liked the colour, and the item was true to its description. Thank you. This watch arrived the day after I ordered it. Brilliant. It is a gift for my son for his 8th birthday. He opened it and loved it immediately. It is a nice, sturdy watch for a child. You can see from the photo that it is a little big, but its not an issue. He is wearing it on the tightest setting. The watch is not waterproof, but he wouldnt be swimming/canoeing with it on anyway. The watch looks exactly as expected. It is an excellent price for a watch for a child. My son is very happy and I would definitely buy from Watch Shop again. 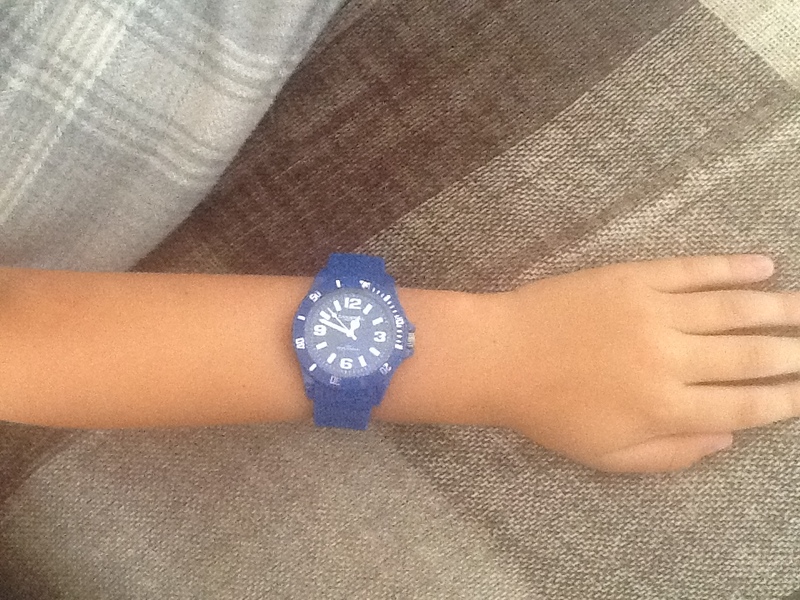 A lovely watch, the colour is bright and ideal for a seven year old boy. I thought it was a Swatch watch because I typed in looking for a Childrens Swatch watch, but am very pleased with it. Delivery was brilliant as it was as stated, which is unusual at this time if the year. Will use the store in future. My daughter really likes this watch, its brightly coloured, easy to read and excellent value for money. The watches, I bought two the same for our six-year-old girls, are very nice indeed. However, they were overtly described as, and in the section for, childrens watches. They are in fact the size of an adult watch. Our girls are not small for their size, but the straps do not have the scope for, I would say, anyone under a teen. I was going to return them, but firstly my girls did not want me to and secondly proceeded to make that impossible by inadvertently ? detroying all the packaging aided by their accomplice, our dog. All-in-all, I feel that it should have been made clearer that these watches are not suitable for those less than adolescents. It is for that reason that I can rate them no higher than average. Really pleased with purchase. Exactly what we were looking for and my son is wearing it every day. Great watch. My son loves it. Great colour, fits a childs wrist very well. Chunky. I bought this watch for my grandaughter who asked me to get it for her for Christmas. She is eight years old , quite tall and advanced for her age. However when I gave it to her she was so excited, but it soon turned to disappointment when she tried to put it on and discovered the strap was far too big and wouldnt fit on her wrist. The description of the the watch leads children and adults to think that it is for children. Thats not the case. So please change it, or reduce the size of the strap to fit. Would recommend the watch shop. Bought the watch for my grandsons. He loves it, it works and looks great. My only minor negative is the watchs colour was not as bright as the image. Lovely watch received in good packaging & in good time. Not used yet as a gift but I am sure it will be great. My son chose it online and is really hoping Santa brings it!!! Disappointing product.The quality was very poor and it was quite large for a child..My grandson is seven years old. The watch is a birthday present for my son. Its fab! The colour is vibrant blue, it looks unbreakable which is a bonus...... He is going to love it! The product is for my nephew for his birthday he chose it out of all the watches on the page. He is very happy with it. Its easy to read the dial. The only down side is the size its a bit too big for a young boy, its almost the same size as a mans watch. Bought this for my 11 yr old son and he loves it. Looks like a ice watch without the price tag. Watch is great - just right. Colour is perfect - bright blue, but Im not sure my son will appreciate the box - pink and white! Not that the box really matters - but when he receives this gift it will be his first impression, and that does matter. ordered this watch for my sons 10 th birthday present, mainly because it was Chelsea blue! a really lovely watch and such great value for money. 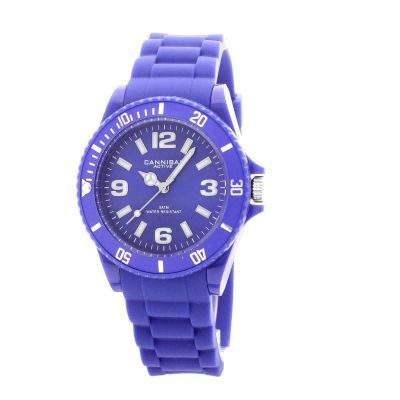 A great watch for both boy or girl in a variety of cool colours. Excellent, as described. Very stylish watch for my 7 year old daughter who loves blue. She thinks its extremely cool. Fantastic speedy service. The watch isnt as vibrant as the blue in the picture, but still a lovely looking kids watch. Really pleased with this watch it is the second one i have bought 1st was in purple for my daughter who is 11 and the second was in blue for her twin brother. Watch is sold as a childrens watch but my son is 9 and this is way too big for him, the face is the same size as his wrist! Even with it done up on the smallest hole it is still loose. I think this would be more of a teenagers watch than a childs watch! Bought the watch for my 9 year old, he loved it. Loved the colour, the turning bezel, and the size, just like a grown up watch! Seems to be well made, and the strap just fits although could do with a few holes for smaller wrists. Excellent product. My 7 year old loves it. He doesnt want to take it off. Been showing it off to all his friends and family since he got it. Highly recommended. A bit dissapointed in the colour. The watch i recieved was not as vivid a blue as on screen, a duller colour of blue, but still very nice. A nice gift for my granddaughter. I am really pleased with this watch that I have ordered for my nephew for Christmas. It looks very good for the money. I am hoping it will perform as well. Good fast delivery and great colour. The item is a gorgeous colour and in terms of the material of the watch itself, it is very strong and i predict it will last a very long time. Very good value for money! Love the watch. Perfect for my 7 year old. Bought it as a Xmas pressie but I know hes going to love it! Service was excellent from from watch shop. I bought this for my son as it looked so lovely and bright but was disappointed as when it arrived it was dark blue. Bought this watch for my son for Christmas, hes 12. It looks every bit as good as the more expensive Ice watch and in fact, I prefer the strap because it is less rigid than the Ice watch. The colour is as pictured and really nice. Not sure how it will last yet but so far I think its a really good buy! This watch is great, and good value for money. It was purchased for my son for his birthday and he is very happy with it. The colour we bright was blue and it is nice although it is not a bright vibrant blue as the picture would suggest which was disappointing, but still a nice blue. Having searched high and low for a suitable watch for my grandson, waterproof, with hands not digital, good appearance and suitable for an 8 yr old boy.I came accross watch shop and exactly what I wanted with a wide choice. Excellent value and I am sure will be well received for christmas. Although bought for a 11yr still had to put an extra hole in the strap. perfect for them as they are good quality and not get damaged easily. My daughter and I chose this watch as a 12th birthday present for her dearest friend, whose favourite colour is blue. Even though we were very pleased when it arrived, I was still concerned that the watch might not be a good fit, that perhaps the colour wasnt right or that the girl wouldnt like the simple style. I neednt worry: it fits her slender wrist perfectly, the electric blue makes it look rather special and she loves the style, which is not linked to any fad or merchandise for once. Since she got it she seems to be making a point of telling me the time, with a big happy smile! This item was bought for my 10 year old grandson for his birthday and he loved it. Bought this for my sons 9th birthday as it was exactly what he wanted. I expected it to be like the smaller size kids ICE watch but it is FAR larger. It looked silly on his wrist and even the tightest hole was far too loose. It would be very helpful to have a face size in millimetres on the description - please add this Watch Shop. However that said, the shipping was bang on time and the other Casio watch we purchased was excellent. Great product. Nice clear numbers and great colour. The strap doesnt have quite enough holes for a 9 yr old so needed to add one. Looks like an Ice watch, but at a great price! Very speedy delivery. Lovely watch, I bought for my son as he had learnt to tell the time. My Son is very impressed with it, loves the colour blue. Amazing service, ordered in the afternoon and it came the next day. bought this watch for my 7-year-old son, his first proper watch! I was a bit worried it would be too loose for his wrist, neednt have worried, just about ok on the tightest fitting. most importantly, my son is delighted with the watch, loves the colour it got the ultimate accolade of being described as cool!, and being late home when hes playing with his friends is a thing of the past....for now, anyway! Fantastic watch looks really good. Smart casual appearance hard warring and durable. Fab watch, nice bright blue colour, very comfortable to wear. No calendar but apart from that very similar to ice watches at a fraction of the price. I thought the watch looked great. My 9 year old who got it for her birthday says it is awesome. Lovely bright blue and clear face for a child. After lots of searching for a replacement watch for my son to replace the one I lost we came across this web site offering good qualitity watches and other items at really good prices. We chose this watch as my son wanted a large faced watch as I wear very big watches, this size was just what he wanted & the fact it was blue he was over the moon when it arrived. Wears it every day, his friends think it cool, the only time he takes it off is when playing rugby and when he goes to bed so he doesnt scratch the face on the wall next to his bed. Summary good watch at an excellent price. Bought for 12 year old son with skinny wrist. most watches that fit him are too young looking. This fits him on the tightest fitting. Friends are impressed. Good quality . Looks just the same as his friends more expensive watch !! Would highly recommend. Overall its a nice watch & very colourful. It was a bit bigger than expected. It does look OK on my 9yr olds wrist. However, I had to make an extra hole quite a way up the strap to make it fit. I think this would be more suitable for a teenager size wise. All that said my boy loves it! The watch was well packaged, looks stylish and fits the bill for what my daughter wanted. This watch has broken twice! The hands fell off within 2 months of wearing it. Watch shop sent a replacement, the first time quickly, The second time I had to chase. We asked if we could change the watch but were sent a replacement instead of eing able to change the pe of watch. The colour is as it is in on the web. My 10 year old Son bought this watch with his birthday money. He chose the colour and when he recieved it, he thought the colour was better in real life. He loves that the watch is luminous and tells everyone too. He thinks that the watch is very comfortable and has only taken it off at bath time and bedtime. He also tells us the time every 5 minutes!! Exactly as stated on site, perfect colour in a fab box! Nice style and described as cool by my son! Very pleased with the watch - our 9 year old son is delighted. Colour and size are perfect. My 13 year old son bought this watch with his birthday money and in his words its groovy! Has a comfortable rubber strap, nice big face and is really quite cool. Comes in a lovely presentation box which is great if being bought as a present. No bad points about this watch. The blue watch was bought for my daughters 9th birthday and although the face is much larger than I expected, definitely large enough for an adult, its been a huge hit. She loves it. Its sturdy and easy to wear. She can be fussy about discomfort of any sort and feels its very comfortable. This purchase is for a child for his birthday present and yet to be given but the quality of service was excellent and we are certain that he will be thrilled with the watch! This is definaitely a great watch for kids. My 11 year old son wanted something loud, sturdy and comfortable to wear and with the Cannibal he definitely got that. Great watch just what we where looking for and an ideal price too very swift and prompt delivery too . Bought this watch for little ushers at our wedding excellent product exactly as is in picture. Ordered by4pm was at house next day fab service. Very pleased with watch ordered and service received, it arrived very quickly, it was for a birthday present and the recipient loved it! Just what we wanted as a present at the right and excellent delivery made it a smooth transaction . My son fell in love with this watch online and loves it even more now hes received. Super quick delivery and all very professional. Many thanks. My daughter chose the colour of this watch to go with her uniform, which it matches perfectly! The watch is really comfortable to wear with the rubber strap, and has a really clear easy to read dial. Stylishly large face too! I have to mention the delivery which from ordering late Friday to delivery Monday morning was superb. Thank you! This watch is far too big for a child. My son is ten - the face of the watch is huge and the strap even on the tightest setting very loose. At best this is maybe a teenage watch. Very disappointing and misleading. Won't be wasting time or money re-ordering. Good watch. My son loves it. Didn't see from the website if it is water proof resistant. Have found out since that it is to 5m. Good packaging. Not particularly quick delivery though. Overall very happy. Great looking watch...I'm sure my son will enjoy getting this for his Christmas. A really great watch that I've bought for my son for christmas. Good quality, great colour, well packaged. I'm pretty sure he'll agree!! Specialising in children's watches, Cannibal watches are a reliable, durable and affordable choice for children of all ages. A range of styles are available for girls and boys, so even the most fashion-conscience kid is sure to love something. Funky and fresh, the bright watches for boys are available in vivid blue and deepest black, and make telling the time a doddle. Girls watches are available in pretty pinks and purples, often featuring cute gem designs perfect for a little princess. Time teacher watches are an ideal option for any children just starting to learn the time. Simple to read and understand, these watches teach analogue timekeeping, with prompts and colour-coding that make learning fast. Find a comfortable and affordable watch for your boy or girl that they'll love to wear by browsing the full Cannibal watch collection here, or check out the full Watch Shop range of kid's watches. Watch Shop is an authorised Cannibal stockist. Sign up to receive email updates when new styles of Cannibal are added to Watch Shop!